Take advantage of Firenze`s clean, elegant and typography focused design where content is the king. Featuring both sidebar & full-width layouts, a variety of post layout options, and numerous sidebar & footer widgets. Firenze is a clean simplicity in customization and is guaranteed to impress any audience. In Firenze you can easily change the color scheme via theme management panel. You can easily change background patterns, and upload a custom background image, change page to boxed or full width, change fonts ( you can choose on of the 600+ available google fonts ). You will be able to create your own homepage by dragging and dropping blocks, adding columns, sidebars, you can them reorder as you want, put 3, 4 or even more sidebars in one page. Firenze includes styled contact form whereby you can easy send e-mails. Firenze theme is offered together with 7 widgets adjusted for the theme and all default widgets are styled too. Firenze has it’s own Bannery system, in which you can add images, text, videos or any other type of HTML code. You can add/edit all effects ( how often banners will show up, after how much seconds it will disappear, effects, fly in time e.c.). 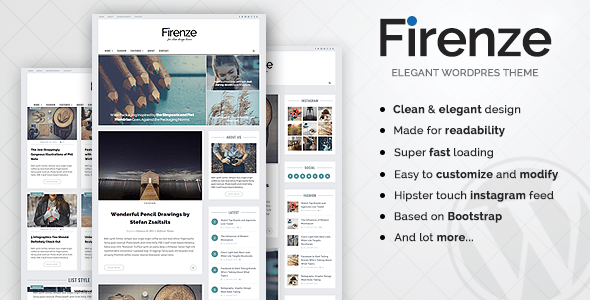 Firenze theme includes language (POT) files – now you can browse them easier and faster. This theme is easily adjustable to other languages by using PoEdit programme which is available free. 4 different category templates, you can create multiple categories and assignt them to different templates. Firenze theme contains shortcodes which can be inserted both by adding shortcode in the post field or by using specific shortcode insertion buttons which make using the shortcode much easier. You can create unlimited sidebars and add new sidebar for each post or page.